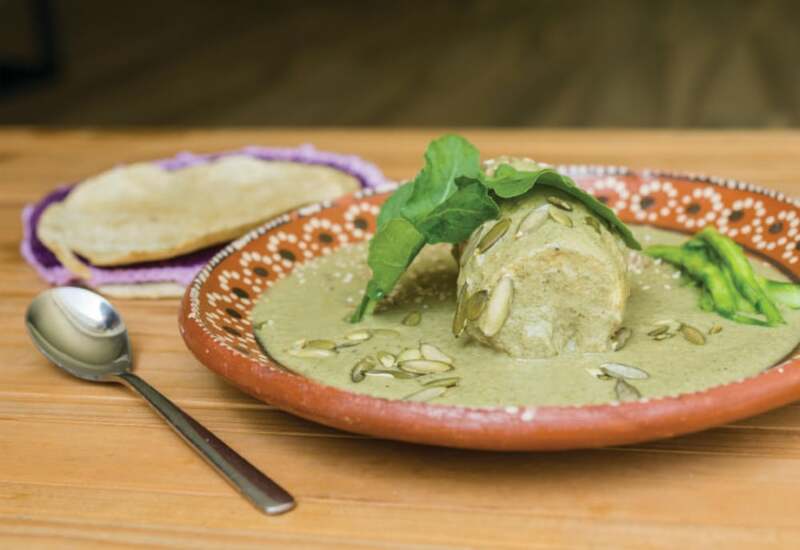 Mole Verde (green mole sauce with chicken) is one of the most popular dishes at Mexican family meals. Made with a mixture of tomatillos, basil, spinach, and cilantro, mole verde has unparalleled flavor and texture, and is one of the most colorful dishes in Mexico. Serve with warm tortillas and a sprig of basil. The tomatillos, pumpkin seeds, sesame seeds, basil, spinach, cilantro, serrano chile peppers, and garlic give this dish its deep flavor. Make sure to use fresh ingredients for best results. Per Serving: 478 calories; 31g fat; 11.4g carbohydrates; 40g protein; 193mg cholesterol; 575mg sodium.